In the article Shed and Garage Solar Lighting we looked at how 12V LED Spotlights were perfect for such applications. With each bulb drawing just 1 Watt of power, a small solar panel used in conjunction with an old car battery is all that is needed to provide hours of lighting, even during the winter months. In this article we will show you how to put together a shed / garage lighting circuit using three 12V LED spotlights and a few other bits and bobs. We will also use a power analysis meter to check the voltages and currents flowing through the circuit to show how little energy is required. Lighting circuits are almost always wired in parallel – from strings of Christmas tree lights to the lights in your home – since adding another light to the parallel circuit does not affect the voltage reaching the lights already in the circuit. If for example you were to wire two 12V bulbs in series with a 12V battery, each bulb would receive only 6 Volts. Wired in parallel each bulb still receives the 12 Volts it needs. Also, if one bulb fails, the rest of the bulbs will remain lit. Above is the circuit diagram for a basic solar shed lighting circuit with three bulbs. This same circuit could be used for any type of bulb whether incandescent, CFL, or LED. You would just need to select an appropriate fuse and ensure that the connecting wires used are thick enough for the current which will flow through them. The LED Bulbs should be plugged into suitable ceramic MR16 bulb holders. These can easily be screwed into the wooden roof of a shed and are fitted with strong connecting leads. The fuse-holder is connected as close to the postive terminal of the battery as possible, and then the switch is fitted into the positive output from the fuse on a sufficiently long length of cable to permit it to be fitted to a suitable location near the doorway of the shed. Next the first bulb is connected into the circuit with the negative battery output and the positive output from the switch connected to the battery holder. Adding a second bulb is simply a matter of connecting the positive of bulb1 to bulb2, and the negative of bulb1 to bulb2. A chain of many parallel connected bulbs can be built up in this way. 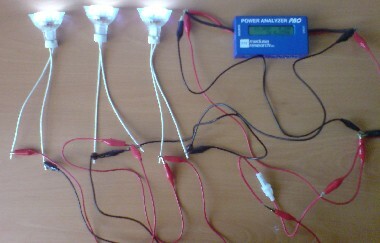 In order to test the lighting circuit a Power Analyzer PRO from US company Medusa Research Inc was used. This displays (amongst other data) voltage, current, power, and energy consumption. An input voltage of 12.336 Volts and a total current through the circuit of 0.29 Amps. The total power consumption is rounded down to 3 Watts from its true value of around 3.5 Watts. The 0.233 Ah is a measure of the amount of battery energy used during the 50 minutes the test circuit was run. With a peak current of under 0.3 Amps cheap bell wire can be used to connect the bulbs, switch, and fuse into the circuit since bell wire is rated for 1 Amp currents. A 1 Amp fuse should be used to protect the circuit from short-circuits. With just a small 5 Watt solar panel connected to the system on a sunny day the battery would still have been gaining charge despite the load drawn by the three bulbs. Therefore this lighting circuit is perfect for use in sheds and garages etc where lighting is used intermittently. Depending on how often the lighting is to be used even a 12 Volt 1 Watt solar panel could be used to trickle charge the battery sufficiently to ensure that lighting is always available when required.